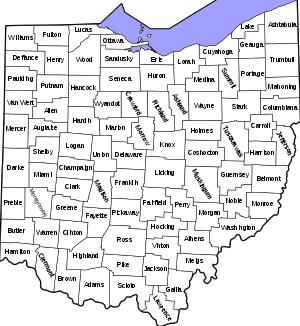 There are eighty-eight counties in the U.S. state of Ohio. The elected county officials include three commissioners, a sheriff (the highest law enforcement officer in the county); prosecutor (equivalent of a district attorney in other states); coroner, engineer, auditor, treasurer and clerk of courts. ↑ 1.0 1.1 "EPA County FIPS Code Listing". EPA. Retrieved 2007-04-09. ↑ 2.0 2.1 2.2 2.3 "NACo - Find a County". Archived from the original on 2007-04-13. Retrieved 2007-07-22. ↑ 3.0 3.1 "Federal Roster: Counties of Ohio, Derivation of Name and Date of Erection". Retrieved 2007-07-22. ↑ 4.0 4.1 "Ohio Genealogy Clickable County Map". Archived from the original on 2007-11-18. Retrieved 2007-07-25. ↑ Resolution of 111th Ohio General Assembly designating John Allen as the person for which Allen County was named. ↑ Ashtabula, Encyclopædia Britannica, 2007. Retrieved 2007-11-19. ↑ Cuyahoga River, Encyclopædia Britannica, 2007. Retrieved 2007-11-19. History of Ohio: From the Glacial Period to the Present Time. Press of F. J. Heer. 1905. Retrieved 2007-08-18. Laning, J.F. (1896). "The Evolution of Ohio Counties". Ohio Archaeological and Historical Publications V: 326–350. http://publications.ohiohistory.org/ohstemplate.cfm?action=detail&Page=0005326.html&StartPage=326&EndPage=350&volume=5&newtitle=Volume%205%20Page%20326. This page was last changed on 22 September 2018, at 19:23.